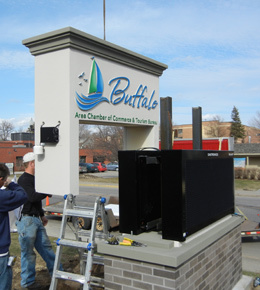 The result is a lightweight, double-sided 7′ 6″ wide x 8′ 4″ high custom sign featuring two parts: a faux brick base and a two-color acrylic stucco surround that encase twin electronic message centers (EMCs). To achieve a durable, streamlined, seamless effect, cellular plastic lettering was coated directly into the sign face. 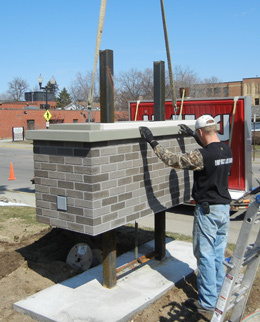 Once on site, the sign was installed by Boo Doo Signs, Inc. of Princeton, Minnesota. 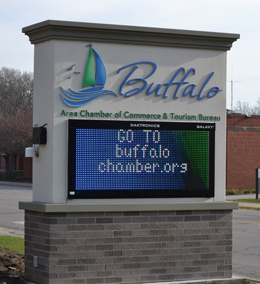 While the pleasing classical lines of the Chamber’s new sign gracefully calls attention to messages displayed on the EMCs, the hardcoated composite-core components will ensure the signage maintains its strength and durability over time. Do you have an upcoming project that calls for unique details? Call the creative team at Signs By Benchmark at 800-658-3444. Their expertise, cooperative attitude, and durable products can be just what you need to satisfy your customers. To view some examples of Signs By Benchmark’s durable, quality signage, browse its website photo galleries. To keep abreast of current projects, sign up for its monthly newsletter.